Reading piano notes is the key to broaden your horizons and getting to know worlds you never thought existed. In order to read piano notes you must get familiar with the meaning of musical beats. Let's start from the basics! When playing piano we play the piano keys and by doing so we create different tone lengths. Piano notes are basically musical signs that tell us which key we have to play and how long we have to play it. In order to measure the different tones we count beats. It's the same as using a meter for measuring your height. Just like your heart, music is beating. Your heart never stops. You don't pay attention to it but you always know it's there, beating. Same goes for music with one exception. The beats are divided to groups by bar lines. The first beat after the bar line is the most heavy and important one. The bar line help us to divide the groups to (fours or threes for example) instead of counting endless number of beats. Every group is called a a MEASURE. 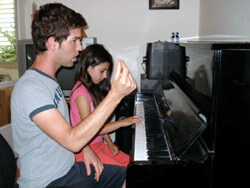 This information will help you to learn to play the piano rhythmically. In this example, every measure includes a group of four beats. Every note gets one count. 1.. 2.. 3.. 4.. When you see a quarter note it means you have to count one beat per note. A quarter note has a stem and a circle painted black. This is a half note. We count two beats per note when we see this note. Unlike the quarter note the circle of the half notes remains white. Last but no least is the whole note, and maybe you've guessed that we count four beats per note when we see it. The whole note has no stem. It's Just a white circle. Now that we've learned the basics of the music rhythm signs. let's see how the song "Merrily we roll along" looks like when we write it with piano notes. Try to play the song on the piano as we played it before and this time count the beats according to the tone lengths of the notes. See how you have to count 3...4... When a half note is located at the second half of the measure? (It's still worth 2 counts). O.k., so now that we learned how basic music rhythm works, and we saw an example of it, let's experience some other music rhythm examples. 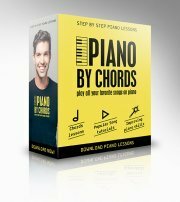 Read the piano notes and play according to the next music rhythm pattern. 2. Point the metronome to 72 Bpm (Beats per Minute). It's a good pace to start with. Place your thumb on the C note, read the piano notes and play the exercise according to the beat. 3. Play again and this time count aloud. Click on the audio file. (The first four beats are left empty to indicate the speed of the rhythm). Here are two more patterns for you. Well done my friend, we're definitely on our way to make you a music rhythmic beast. In the beginning of musical pieces you will see numbers. These numbers are called the time signature. 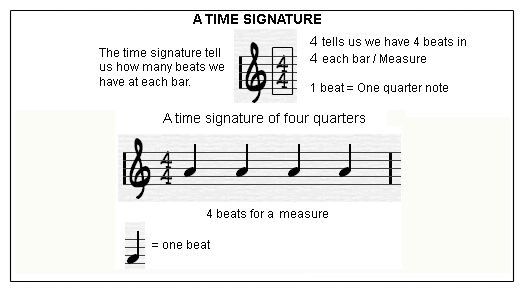 The time signature tells us how many beats we have to count per measure and how long a beat lasts. Remember to always first take a look at the time signature. It will save you a lot of time with figuring what you have to play and how to play it. 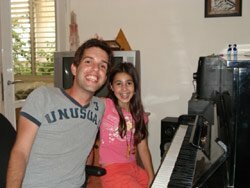 Now, if you're serious in turning into a real piano player you should remember that playing rhytmically is one of the most important things that will make you a great player. The only problem is that when we learn to play the piano we have to take care of various elements at the same time. We have to remember the piano key names, then read piano notes and learn to read piano notes on the staff and disinguish between the different tone lengths.